Although buying a home is a rite of passage and the American Dream, it’s also the largest asset most people will purchase. First-time home buyers are prone to missteps that can be avoided with real research and a trusted partner that will help you steer clear of pitfalls. That’s where Bay Property Group comes in. Are you ready to make the investment? Keep in mind that down payment isn’t everything — we recommend you set aside 1–3% of your purchase price to cover unexpected fees and expenses and for an added cushion, it’s prudent to hold at least six mortgage payments in the bank in case of emergency. The Bay Area is a notoriously expensive place to live, making it imperative for aspiring homeowners to have a solid financial foundation before entering the market. Metro-wide, the median price of a home is $900,000 — nearly four times the national average. The California Association of Realtors (CAR) set off to find what Bay Area residents need to earn to buy a median-priced home there, which varies by county. Read their analysis here. 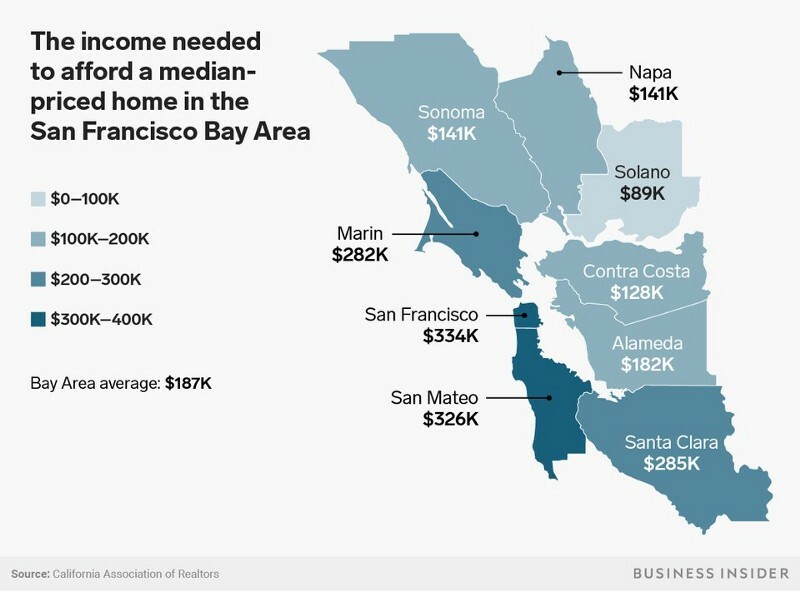 The map below, compiled by Business Insider, shows the minimal annual incomes needed to afford a typical home in the Bay Area. If you have all of your financial ducks in a row, let’s dive into getting started. Bay Property Group advises first-time homeowners to compare rates and fees from at least three lenders. If you only approach one lender, you can potentially be leaving thousands of dollars on the table. As you are comparing quotes, ask whether any of the lenders would allow you to buy discount points, whereby you can prepay interest up front to secure a lower interest rate on your loan. How long you plan to stay in your new home and whether you have a lump of cash to purchase the points are two factors to put a finger on to see if buying points make sense. Getting pre-qualified for a mortgage is one thing — you get a ballpark figure of how much a lender may be willing to lend you based on your income and debts. But as you get closer to buying, it’s prudent to get a preapproval letter, where a lender more thoroughly examines your financial picture and confirms in writing how much they are willing to lend you, and under what terms. Armed with a preapproval letter, you look much more serious to a seller than the next buyer and this document can give you an upper hand in negotiations. What’s your credit’s bill of health? Since most home buying transactions involve a sizable home loan or mortgage, your credit score is clearly a paramount consideration. To get the best interest rate and loan terms, Bay Property group recommends you check your credit report before embarking on the home buying process and dispute any errors that can be dragging down your score. There are several opportunities to improve your credit, such as making a dent in any outstanding debts. Finally, to avoid a dip in your credit after you apply for a mortgage, resist the temptation to open any new credit accounts, like a credit card or auto loan, until your home closes. Once you and your agent find the right home, the transaction process begins. Typically, we’ll start by making an offer and once it is accepted by the seller, you’ll need to get an inspection and insurance. The results of the inspection will only tell you so much and not all inspections test for things like radon, mold or pests, and we stress the importance of knowing what is included. We also recommend you attend the inspection and pay close attention, ensuring the inspector can access every part of the home, such as the roof and any crawl spaces. Don’t be afraid to ask questions and ask your inspector to take a look — or a closer look — at something that is of concern. Before you close on your new house, the lender will require homeowners insurance. At Bay Property Group, we advise our clients to shop around and take a hard look what’s covered in the policies. Searching for your first home can be fun and exciting, but it is also a challenge. Our home advisors will provide professional advice at every stage of this process and will be there to prepare you for the decisions, occasional disappointments and ultimate delight you’ll experience when you get the keys to your first home. We hope you are lucky and quickly find an affordable home you are in love with, the seller accepts your first offer, you move into your new dream home with no broken dishes and your new neighbors bring you a casserole to welcome you. But for other first-time buyers, there are minefields to navigate. However easy or challenging, you can count on Bay Property Group for informed guidance.